Nikola Tesla was a Serbian-American electrical engineer and physicist. He invented the alternating current induction motor. Tesla was born on July 10th, 1856 in Smiljan, which was then a part of Austria-Hungary and is now part of Croatia. Tesla’s father was a priest in the Serbian Orthodox religion. Tesla was given a technical education in Graz and at the Charles-Ferdinand University of Prague. Tesla came down with a very severe case of cholera in 1873 and his father promised that he would send Nikola to the top engineering school if he recuperated. Originally, Tesla’s father wanted him to become a priest. Tesla’s higher education was irregular. He dropped out of the Austrian Polytechnic, and though he attended classes at the university, he never formally enrolled there. After that, Tesla worked for the Budapest Telephone Exchange as an electrician. Tesla moved to France and then to the United States in 1884, where he began working for Thomas Edison. He quit when Edison didn’t pay him enough for hard-won improvements to the company’s generators and motors. After 1900, Tesla devoted himself to independent research at his own laboratories; one on Fifth Avenue in New York City and the other on Houston Street. Even as a student Tesla was inventive. He created a motor that did not need a commutator to function. A commutator is a device that switches the direction of a current in some generators or motors that run on electricity. Tesla invented a motor with coils that were arranged so that when alternating current energized them they cast a magnetic field that rotated at a predetermined speed. Tesla patented this rotating field motor in 1888. Fortunately, he was able to sell it at a time when the advocates of alternating current were in the market for such a motor. Tesla sold his patent to George Westinghouse. Tesla also made advances with frequency apparatuses and high voltage. 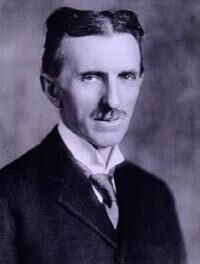 He invented the Tesla coil, a system of arc lighting, a generator for high frequency currents, a system for wireless transmission and a high potential magnifying transmitter. The magnifying transmitter was a machine that could produce millions of electrical volts that manifested in long, spectacular arcs. Tesla formed his own company not long after leaving Edison with money from several investors. He held at least 278 patents. Tesla also made advances in radio transmission, but fell into patent troubles with Marconi. He also had troubles with another backer, J. P. Morgan, who promised to pay for Tesla’s Wardenclyffe Tower wireless broadcasting experiment. The tower was never properly used and was demolished in 1917. Tesla spent the last part of his life in a series of hotel rooms, and he died on January 7, 1943 in a room at the New Yorker. Though he had made a lot of money over his lifetime, he died in poverty.